Home » Events » Winners of the Africa Express competition! 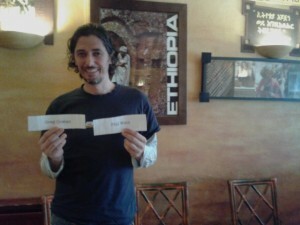 Comments Off on Winners of the Africa Express competition! They answered the three questions below correctly and were picked as winners by staff at local restaurant, Addis this afternoon. The picture was taken at the restaurant immediately following the draw, many thanks to the lovely Addis customer who agreed to have his picture taken!